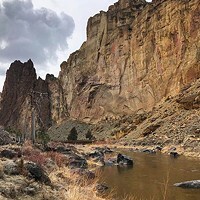 Bend has many sandwich shops, and most of them will deliver a basic sandwich with bread, meats piled directly in the center and spreads like mayo and mustard doled out willy-nilly. The multi-layer Murray and other sandwiches and soups are available at Hogan:s Hoagie Stop at River's Place in east Bend. At Hogan's Hoagie Stop, you'll get a sandwich that might keep you up at night, waiting for tomorrow's lunch, when you can try another. Jason Hogan and his wife Hillary opened the sandwich food cart at River's Place on Purcell Boulevard on Oct. 28. 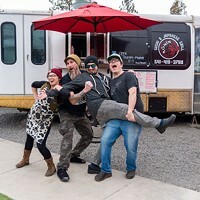 Prior to the sandwich cart, Hogan operated the Real Food Street Bistro by The Lot, before he took a job in Corvallis, Ore., as the chef of a sorority at Oregon State University. Summer break had the Hogans debating their future. "We still had the food cart, and thought 'what do we want to make,' and we both said, 'sandwiches,'" Jason Hogan said. Today, Hogan's Hoagie Stop serves seven sandwiches, as well as soup. Hogan also makes his own snickerdoodles. I started off with The Murray, which includes sliced grilled turkey, salami and roast beef surrounded by provolone and gouda cheese, grilled onions, tomato, house sub sauce, garlic mayo, crispy onions, shredded lettuce and banana peppers tossed in Italian vinaigrette—all in between a Big Ed's po boy roll. Co-owner Jason Hogan sticks his head out of the food cart. The first bite was delicious. All the layers of the sandwich could be a stand-alone dish. The meat is cut to the perfect thickness—not so thin as a cheap Carl Buddig cut, but not so thick that it's like grandma's turkey dinner. The crispy onions set off the sandwich by giving it some crunch. The lettuce and peppers could be a side dish, well flavored with the vinaigrette, but not overbearing. There's enough Hogan's sub sauce—Hogan's own creation of fresh herbs, spices, capers, garlic and just enough olive oil for consistency—for a bit of bite and the cheeses are excellent compliments to the meat. The fresh roll from Big Ed's doesn't disappoint. The sandwiches are large enough to share, but who would want to? I'm not a big eater, yet the only regret I had was when all the food was gone. Many of the sandwiches offer similar toppings as The Murray, while The Jersey deviates a bit with grilled roasted beef, grilled onions, smoked gouda and horseradish crema. The Hot Ham, meanwhile, features grilled ham, melted American Cheese, grilled onions, those delicious crispy onions, honey mustard, garlic mayo with dill pickles and banana peppers on Big Ed's po boy. The Valley Style Hoagie is the vegetarian of the lineup and Jason Hogan's current favorite. It comes with grilled tempeh, seasonal veggies, herb tomato, smoked gouda and sub sauce, topped with the shredded lettuce and peppers. The Pops is three fried eggs topped with melted provolone cheese, heirloom tomato, garlic mayo and grilled onions on Ed's po boy. The final hoagie on the menu is the O.G. Combo, consisting of American cheese melted on Big Ed's sourdough. My son had one a few weeks ago and he's been requesting them ever since. You can add a choice of meat for an extra $2 and a cup of soup for $3 more. River's Place has inside and outside seating to enjoy beers and great food. Jason Hogan brings plenty of experience to the sandwich cart. He said he worked in restaurants for 20 years, getting his start in the kitchen with his mom when he was 4 or 5. In his home of North Carolina, he grew up cooking Southern food. He said he made his first meal for his parent's friends when he was 10 years old. His family moved to Bend in the '90s where Hogan went to high school, eventually going to culinary school in Bend as well. 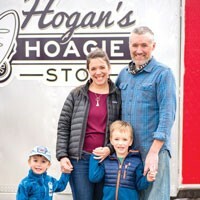 As far as the future goes, Hogan said he'd love to have an actual shop with a little pub where they can offer other types of food—but for now the cart suits him well. Hogan said he plans to expand his soups in the near future, including clam chowder.